Tim Sherwood seems to have lost the Tottenham dressing room and Spurs have defensive injury problems so back Benfica to qualify for the UEFA Europa League quarter-finals with a second emphatic defeat of their English opponents. One questioned whether bookmakers were correct to be bullish about Benfica’s chance of avoiding defeat in the UEFA Europa League last-16 first leg at White Hart Lane. Tottenham boss Sherwood had challenged his players to make a statement but the former Spurs midfielder’s call to arms appears to have had the opposite effect. 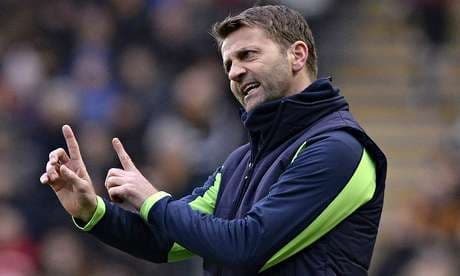 It would seem that Tottenham stars have not taken kindly to Sherwood’s comments, something that was always a distinct possibility given the rookie manager’s reputation as a difficult character during his playing days. Benfica proved that it was worthy of being quoted at fairly short odds in the UEFA Europa League last-16 first leg and now, with Tottenham being unable to field anything like its first-choice defensive unit, it is time to join the camp of the Portuguese Primeira Liga team. Benfica has won each of its last nine matches across all competitions and it has scored in every one of its 19 home games this season. Tottenham winger Andros Townsend has said that Spurs have nothing to lose and he is right. Tottenham has to score at least three goals in normal time to reach the UEFA Europa League last eight so one can expect Spurs to throw caution to the wind from the first whistle. One can also expect Tottenham’s heads to drop if Benfica opening the scoring. Benfica is available at odds of 1.73 with Stan James to beat Tottenham and, given the circumstances in which Spurs find themselves and the home side’s formidable statistics, it makes sense to bet on another sorry day for Sherwood. There was not much wrong with the performance of Napoli in its UEFA Europa League last-16 first leg versus Porto and the Italian Serie A side is fair value at odds of 1.95 with Boylesports and Paddy Power to win the return. Napoli gave as good as it got in Porto and it took a wicked deflection off Raul Albiol for Jackson Martinez’s shot to beat Pepe Reina in the Italian Serie A team’s goal for the only goal of the first leg. A change of venue and a change of luck should be sufficient for Napoli to win at home, although its lack of an away goal may prove problematic in terms of reaching the UEFA Europa League quarter-finals. A home record of 16 wins, four draws and one loss – a shock 0-1 reverse to Parma – gives cause for optimism to Napoli, whereas Porto’s away numbers are ordinary for a side that plays a lot of second-tier teams in its domestic league and cup competitions. Porto’s away record reads seven wins, six draws and five losses, with most of the Portuguese Primeira Liga side’s draws and losses coming in its toughest matches. Finally, the UEFA Europa League last-16 first leg between Basel and Salzburg did not go according to the script as neither high-scoring, high-conceding side managed to score in Switzerland. The statistics do not point to a low-scoring second leg in Austria so one is interested in backing both teams to score at odds of 1.80 with 888sport and Unibet. Over two and a half goals is much, much shorter odds. Basel cannot sit back and wait for something to happen. The Swiss Super League side cannot be confident of stopping its Austrian Bundesliga opponent from scoring since Salzburg has found the back of the net in every one of its 30 competitive home games going back to December 2012, at least three goals in each of its eight matches at the Red Bull Arena. Salzburg even managed to beat Bayern Munchen 3-0 in a friendly game. Such is Salzburg’s irrepressible form that making the UEFA Europa League quarter-finals may be beyond Basel but an away goal certainly looks within its grasp. Basel has scored at least once in 19 of its 22 road matches this term, including two in its surprise UEFA Champions League win at Chelsea.